Programs, activities, events need to be evaluated in order to determine what is good and bad about them. The evaluation aims to point out the good points about the said program, event. or activity so that they can continue to do to it the same way in future programs. It also points out the things that must be improved or changed in the program, event, or activity to make everything better. 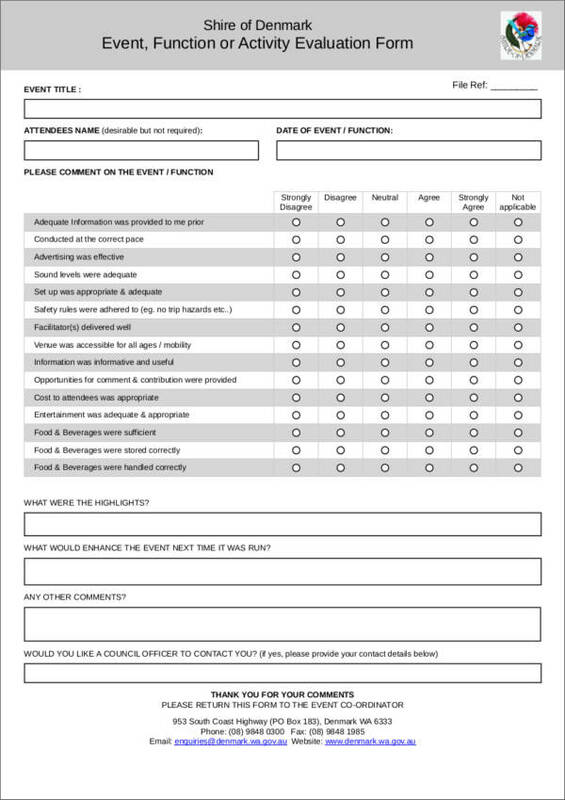 Activity evaluation forms are used to easily conduct evaluations of activities, programs, or events. 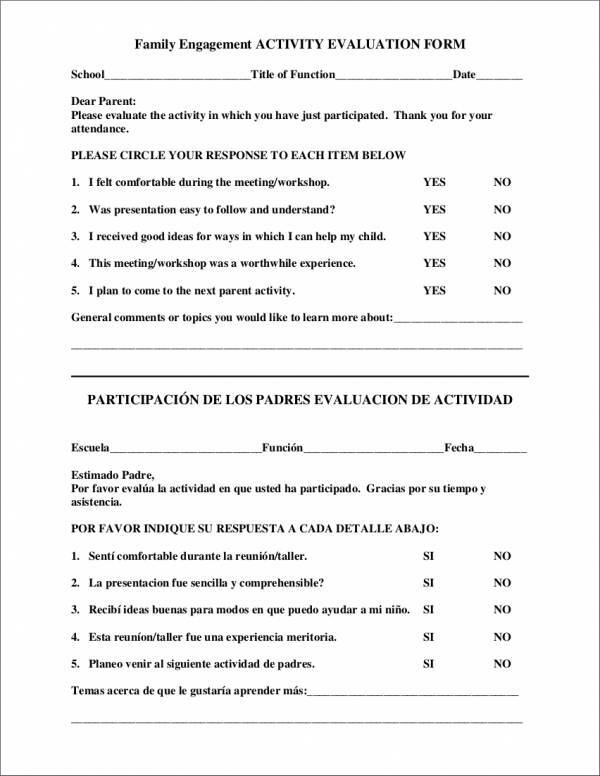 These forms contain questions that help in getting feedback from the participants of the said activity. 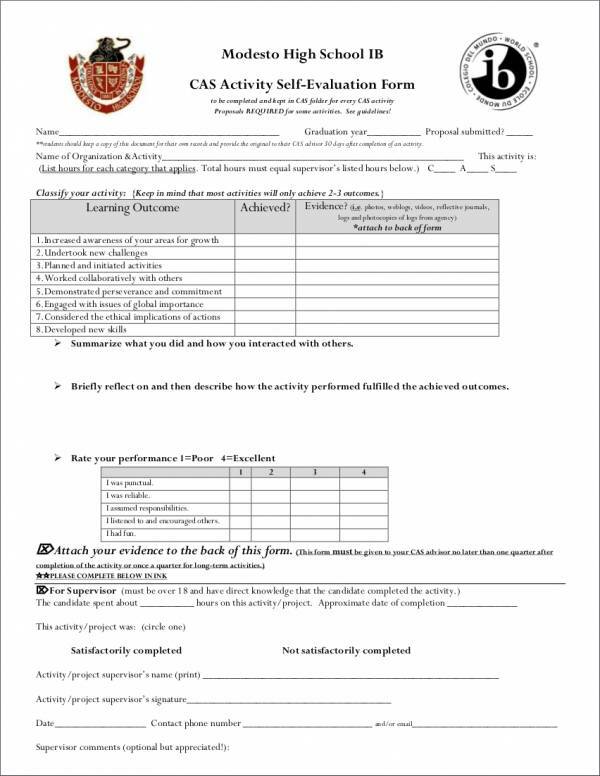 Free and downloadable activity evaluations forms will make it easy and convenient to conduct this kind of evaluation, especially in a large scale activity. 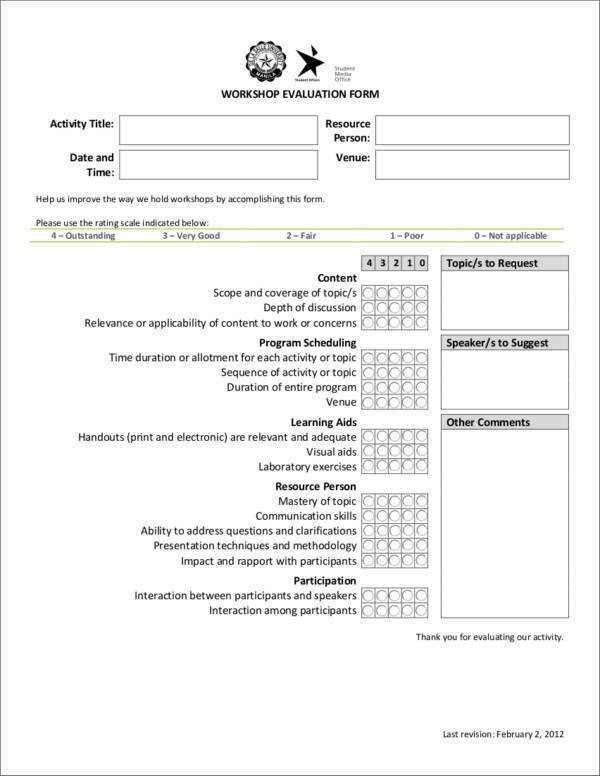 Available in this article are 16 different activity evaluation forms to help you with your activity evaluation needs. Why Is It Important to Evaluate Activities? It is important that activities get evaluated to find out a lot of things related to the activity and to identify if the activity has been successful or not. Evaluation is done for a lot of different things, aside from activities. Below, we have made a list of the many reasons why activity evaluation is important. It helps determine the good and bad parts of the activity. All activities aim to be successful and effective, but not all are able to have this kind of outcome. To determine the outcome of an activity, it has to be evaluated by the audience and the participants of the said activity. Their understanding and learning of the activity is one proof of its effectiveness. It makes the facilitators aware of the areas for improvement. Perhaps the best way to determine which part of the activity needs to be improved is through an activity evaluation. This is where the audience and participants can honestly provide their opinion of the activity that was conducted. Allows one to demonstrate the impact of the activity. Through the information gathered by the facilitators of the activity, they can make an impact on the audience and participants. This is because the information will enrich the knowledge that participants have about the topic of the said activity. Learning activities can be assessed in an organized and effective manner. School activities aim to facilitate and improve the learning experience of school children. This can be done through activity evaluations and assessments. Enables facilitators to gather feedback. One way to get a good evaluation of an activity is by gathering feedback from both the audience and the participants of a particular program. Through feedback, good and bad points of the activity can be determined and helps in making improvements. Evaluation results make good research or survey data. The data gathered from evaluations can be used as future references as the data came from real participants and audiences and not observations. Different types of activities require different types of activity evaluation forms that are appropriate for their use. 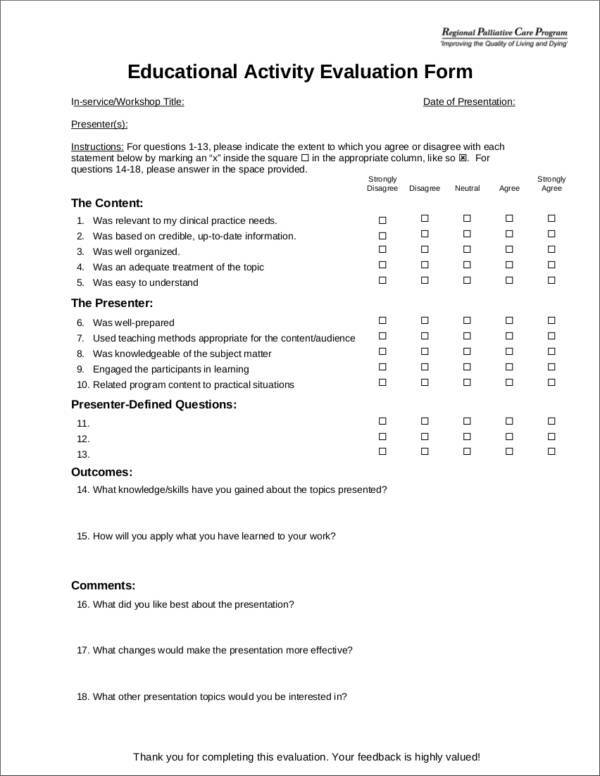 Other evaluation forms that you may find useful are seminar evaluation forms, student self-evaluation forms, and trainer evaluation forms, to name a few. 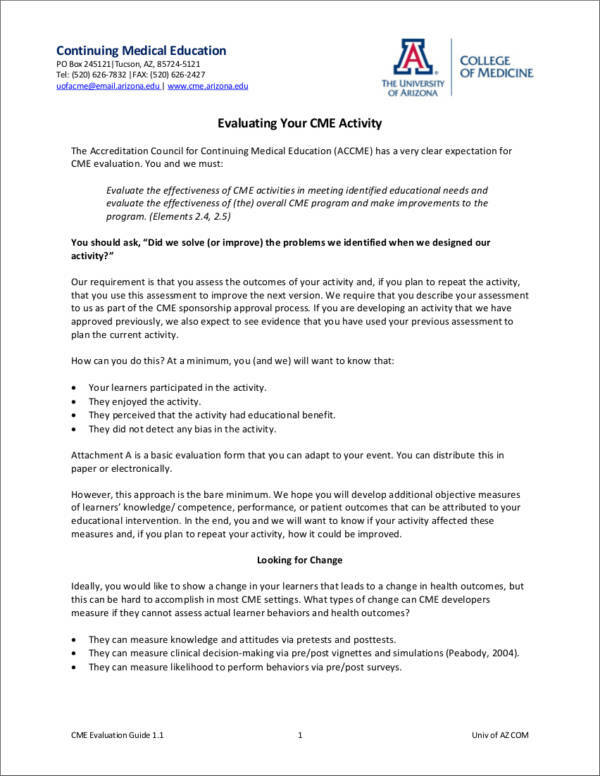 When Should an Activity Evaluation Be Done? The evaluation of an activity should ideally be done right after the end of an activity. This is because the memories and the experiences of the audience and participants about the particular activity are fresh allowing them to provide a more precise feedback. 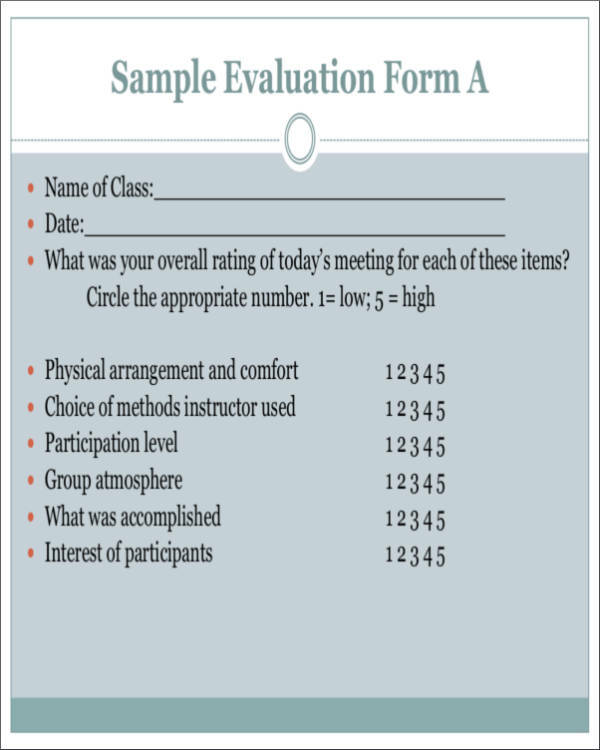 In order to have this done, some evaluators provide the activity evaluation form before the activity starts. There are also instances when evaluations are done a day after the activity took place. This is still okay as there are really no deadlines as to when evaluations should be done, except if one is provided or required by one’s school, company, or organization. Why Is an Evaluation Form Important? Things nowadays have been made easy and convenient in order to improve people’s lives. Evaluation forms are no exception. 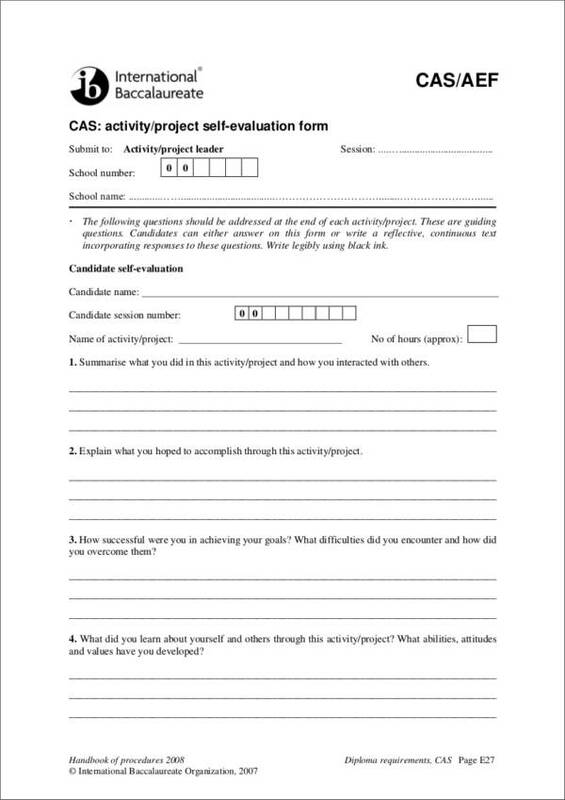 Evaluation form promotes objectivity in the processes of assessment. Evaluation form provides a guideline encapsulating particular standards to be followed. 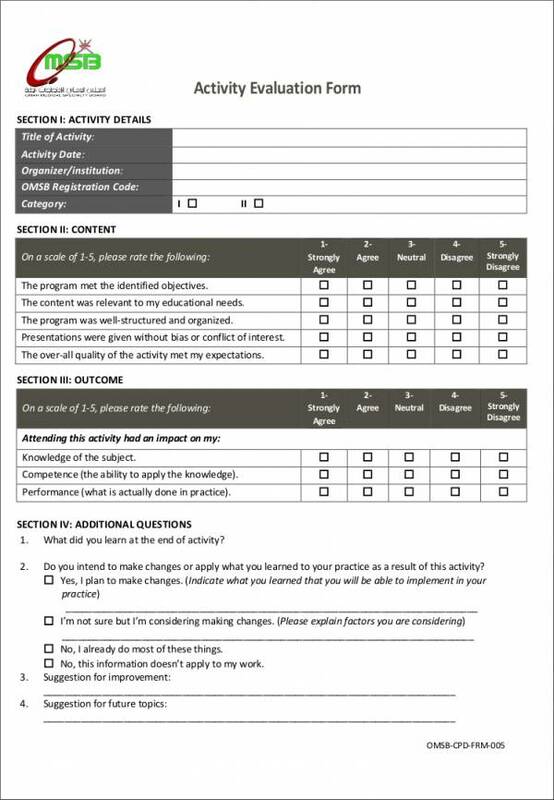 Evaluation form ensures the organization of metrics, attributes, and assessment weights. Evaluation form creates a medium where the needs of the business can be considered when implementing evaluation procedures. 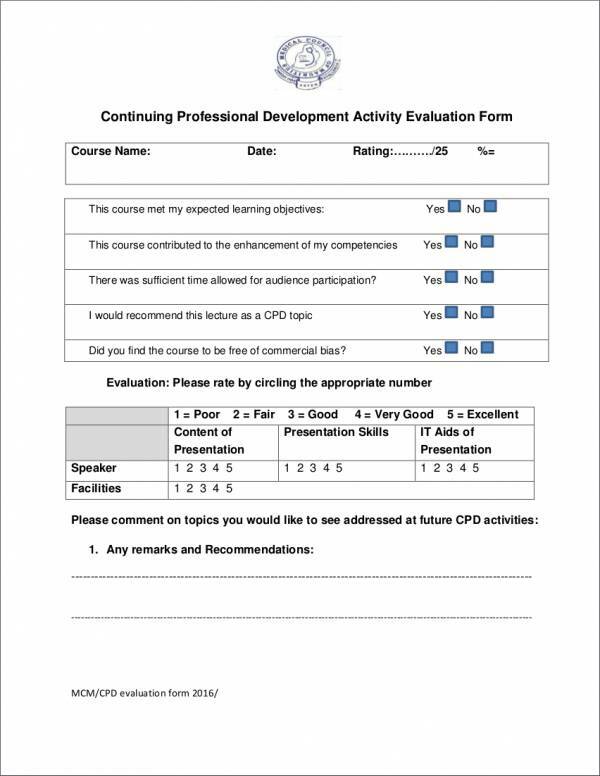 Evaluation form can be used as a reference when comparing various assessments done in different time periods. Evaluation form ensures that the development of processes can be obtained through continuous bookkeeping and recording of actual results. Think of the information that you need to collect. Before the activity starts, you should already have a plan prepared for what information you want and need to gather. This includes which parts of the activity should be highlighted, who will take the pictures, who will make the documentation, and who will count the heads or number of people participating in the said activity. Make a register of all the people involved in the evaluation. If you are working in a group, having a register of all the members will be convenient as you will know who to call and who to ask help from. Review the activity evaluation data that you have gathered. To ensure that you are doing the right thing and gathering the appropriate information, you will need to review the data that you have collected. It will help you determine any problems and find a resolution or gather additional data in a timely manner. Good or bad, every feedback you gather is important. It is where you people get honest with how they feel and think about the activity. A feedback could be something about a person’s learning, what they like and don’t like about the activity, and suggestions on how the activity could have been better. Evaluation forms contain both yes or no questions and open-ended questions, but they don’t have the same questions in each form. The questions included vary depending on the type of activity being evaluated. We have gathered here sample questions that can be included in an evaluation form. What made you interested to join the activity? What did you not like about the activity? What have you learned from the activity? What could have been done to make the activity even more interesting? Was the activity relevant to the topic being tackled? Did the activity help you in any way? Did you find the activity interesting from start to end? What one thing will you do differently after participating in the activity? How would you rate your level of involvement in the activity? 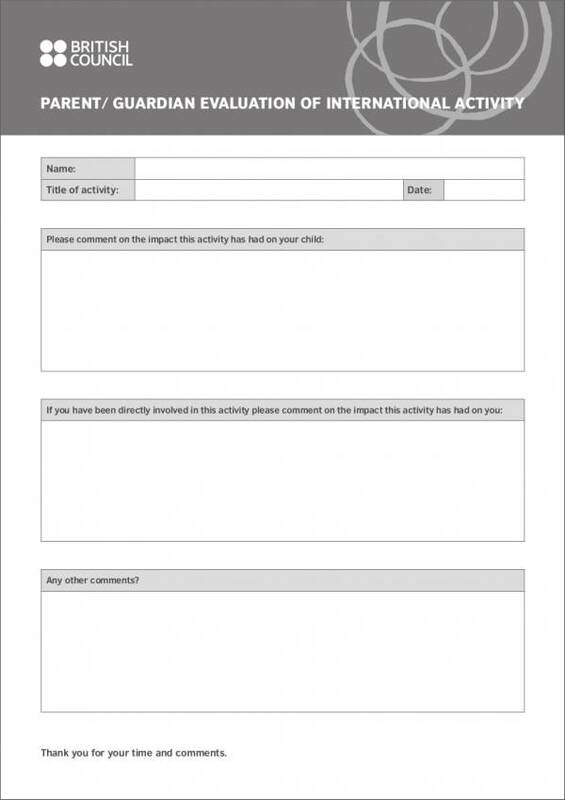 What Are the Characteristics of a Good Activity Evaluation Form? 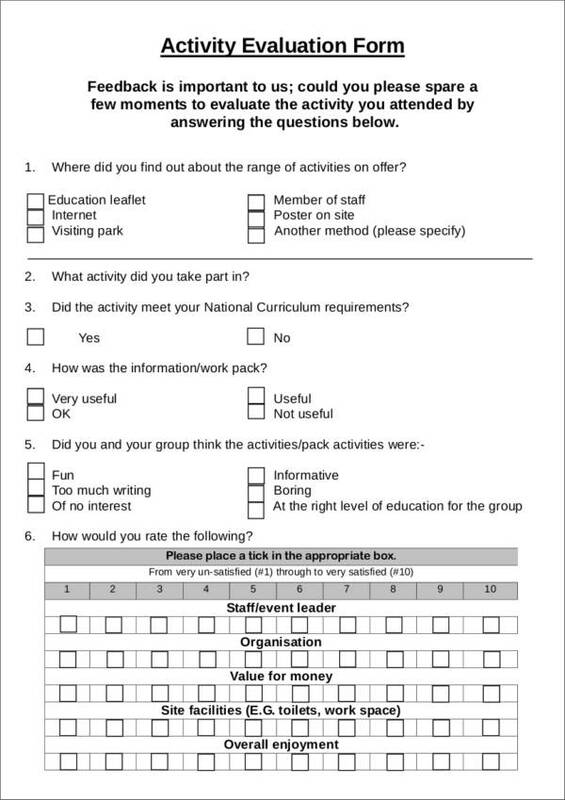 A good activity evaluation form is one that is effective and appropriate for the type of activity being evaluated. 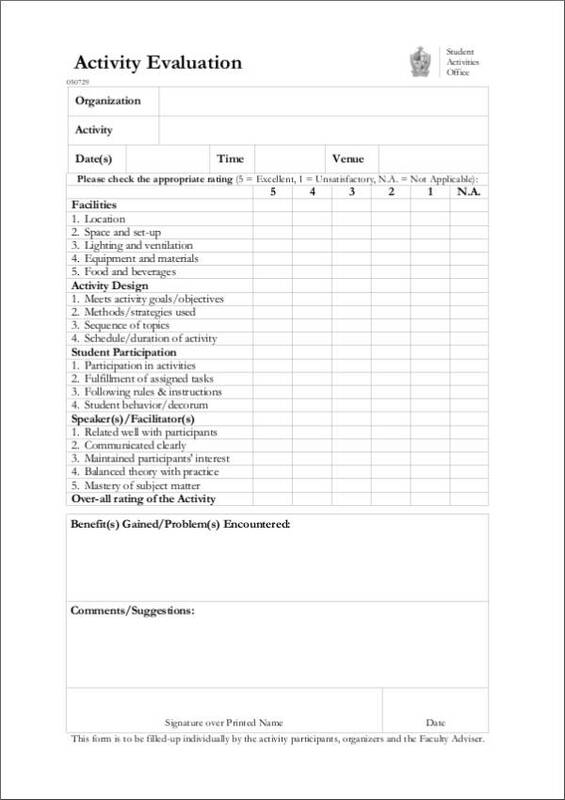 Below are the characteristics of such activity evaluation form. It contains questions that are in line with the goals of the evaluation. It includes a well-balanced set of questions. It focuses on the specific topic. It should have a good rating system. It should be based on accurate data. It should be properly and professionally formatted. It must follow the standard procedures required for activity evaluations. It should be based on the proper weighing of attributes necessary for the activity.